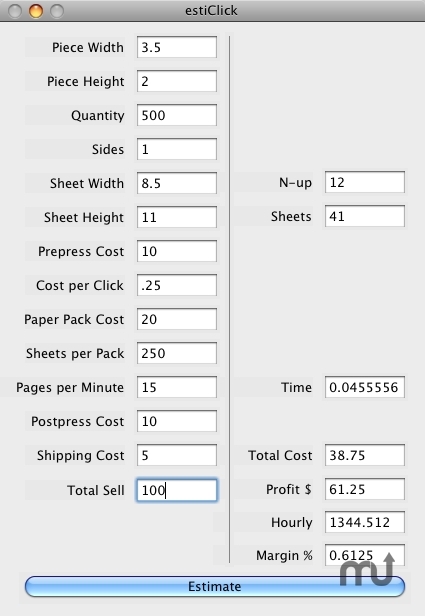 Cost estimator for printers whose costs are charged by the page. Is there a better alternative to estiClick? Is estiClick really the best app in Finance category? Will estiClick work good on macOS 10.13.4? estiClick is a cost estimator for digital printers whose printing costs are charged by the "click" or page, as opposed to actual toner costs. Allows you to input various incremental costs, and calculates total cost, profits, time and more. Check out the screenshot! Mac OS X 10.4 or later, an open mind to software under development. estiClick needs a review. Be the first to review this app and get the discussion started! estiClick needs a rating. Be the first to rate this app and get the discussion started!